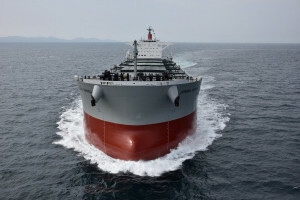 Kawasaki Kisen Kaisha, Ltd., Tokyo, (hereafter called “K” Line) is proud to announce the delivery of “CORONA XANADU,” an 88,000 DWT-type special coal carrier at Shin Kasado Dockyard Co.,Ltd. of Imabari Shipbuilding Group Japan on May 23, 2018. CORONA XANADU is same type as “K” Line’s specialized fleet for transport of thermal coal known as the “Corona-series”. The Corona-series consists of epoch-making coal carriers equipped with wide beam and shallow draft, which are the most suitable type to enter ports of domestic Thermal Power Stations to discharge cargo. CORONA XANADU is equipped with latest energy saving and ecological technology such as WAD (Weather Adapted Duct) which promotes her propeller efficiency and ballast water management system which saves marine ecosystems.